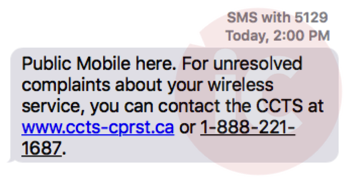 Public Mobile—which is owned by TELUS—has proactively reached out to customers via text message to inform them about how to address unresolved wireless complaints with the CCTS. Public Mobile here. For unresolved complaints about your wireless service, you can contact the CCTS at www.ccts-cprst.ca or 1-888-221-1687. The Commissioner for Complaints for Telecommunications Services (CCTS) is an independent organization dedicated to working with you and your telecommunications service provider (TSP) to resolve complaints relating to your telecommunications services. The best way to deal with a complaint about your service is to contact the service provider and try to resolve it directly. However, sometimes that just doesn’t work out. If you need help, we are here to assist you and the service provider to get the issue resolved. If possible, we will help you reach an amicable resolution acceptable to both you and the provider. If not, we will analyze the complaint and provide our views about the merits of your complaint and the best way to sort it out. According to the CCTS’ mid-year 2016 report, Public Mobile had 29 complaints received. If you have a wireless issue to deal with, the CCTS is your friend in trying to resolve issues.